Sally is a retired nurse lecturer who has lived in Crickhowell since 1980 and worshipped at St Edmunds for almost 25 years. She is married and has three grown up children and seven grandchildren. Sally was ordained as a permanent deacon in 2014 and has a ministry to older people in the community. This ministry involves visiting people in their own homes or in hospital and taking Home Communion to those who are housebound. Sally leads the Pastoral visiting team which in addition to visiting people in their homes, provides regular social activities, worship and spiritual care for those in Care Homes and Retirement facilities. Sally and the team aim to provide church friendship and fellowship to those who desire church contact and are unable to participate in regular church services; and to ‘walk alongside’ people in need. 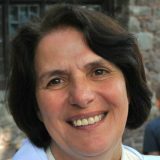 Sally is based at St Edmund’s but her role extends across the Ministry Area helping other churches to develop pastoral visiting teams in their communities. In 2018 Sally was appointed as the Bishops Officer for the Ministry of Older People in the Diocese of Swansea and Brecon.